It is among the most popular movie franchises of all time. It appeals to multiple generations and is beloved by ardent and casual fans alike. Now, it has its own theme park land. Make that two theme park lands. 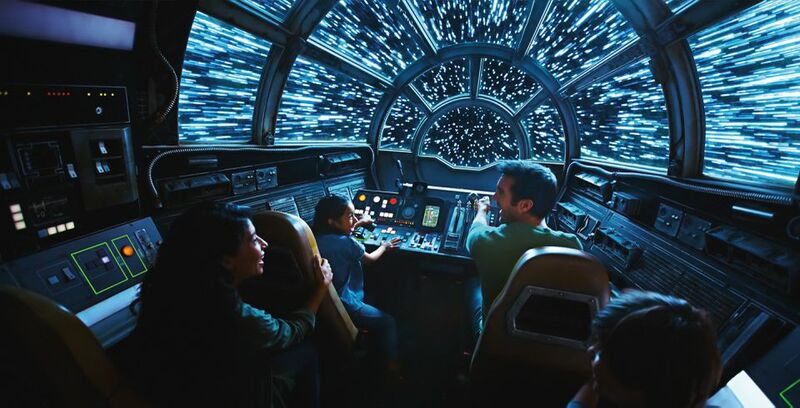 Star Wars: Galaxy’s Edge, located at Disneyland Park in California and Disney’s Hollywood Studios at Walt Disney World in Florida, brings the galaxy far, far away to life here on Earth and invites visitors to experience their own Star Wars adventures. (The lands are scheduled to open May 31, 2019 at Disneyland and August 29, 2019 at Disney World.) It is like stepping into the movies or interacting with your playset IRL. The two lands are essentially identical and, at 14 acres each, represent Disney’s largest expansion devoted to a single creative property. Estimated to cost a cool $1 billion—that’s for each location—they are also likely the most expensive single-themed lands the company has created. Galaxy’s Edge follows a trend that was largely started by Universal when it opened the first Wizarding World of Harry Potter at Islands of Adventure in 2010. Instead of developing one movie-based attraction (such as Star Tours, Disney’s first Star Wars tie-in, which will continue to blast off at their current locations in Disneyland and Disney World), Universal built an entire, encompassing land where everything is dedicated to the story. You can't buy a King Kong, Minions, or generic Universal Orlando T-shirt, nor can you purchase a Coke or a slice of pizza in the Wizarding Worlds, because those items wouldn’t be for sale in Harry Potter’s “real” realm. You can, however, pick up a Hogwarts robe, a wand, or a butterbeer. Disney responded with its own IP-focused lands, including Pandora: The World of Avatar, Cars Land, and Toy Story Land. Galaxy’s Edge takes the concept to the next level. Visitors are deeply immersed in the Star Wars mythology. The setting for Galaxy’s Edge is Black Spire Outpost, a trading port on the planet Batuu. Located on the outer reaches of the galaxy, the port had once been a thriving way station for crews to refuel and restock according to the backstory conjured by Walt Disney Imagineering and Lucasfilm. In the age of lightspeed travel, however, Black Spire Outpost has become less relevant, and is now populated mostly by rogues, scam artists, and other colorful, if shady characters. Upon entering the land, visitors see fighter ships and other spacecraft tucked into alcoves and parked on elevated docking platforms. The sleek vehicles and the land’s other high-tech elements contrast sharply with the village’s ancient buildings, some of which appear to be decaying. Many of the structures feature domed roofs. The outpost’s architecture has a vague Middle Eastern vibe. Impressive rockwork rings the land and helps to convey the illusion that it stretches for miles (even though a Dumbo ride and a Slinky Dog-themed coaster are out of sight just beyond the lands’ berms). Tree stumps that have petrified into spires give the outpost its name. The elegant spires climb high and punctuate the rockwork. Disney employees who are cast as villagers wear a variety of mix-and-match garb rather than a standard costume. They are encouraged to interact with visitors and share their stories about living and working on Batuu as well as draw the guests in to the planet’s mysteries and tales. Adventure beckons throughout the land and inspires guests to explore and discover its secrets. Millennium Falcon: Smuggler’s Run— Walking down a path just beyond the marketplace of Black Spire Outpost, visitors may be startled when they first catch a glimpse of the Millennium Falcon. The full-scale starship, perched some 30 feet in the air and spanning over 100 feet, is breathtaking. Part of our cultural currency, it has only existed in the abstract until now. Not only do you get to see Han Solo’s legendary bucket of bolts, you get to pilot it. And by “pilot it,” we don’t mean that you’ll passively ride along on a pre-ordained journey. We mean that you'll, well, pilot the ship and actually control the experience. Using highly sophisticated technology, including powerful gaming engines, Disney has designed an interactive motion simulator attraction. Guests enter the cockpit of the Millennium Falcon in groups of six consisting of two pilots, two gunners, and two engineers. With a gazillion buttons, levers, thrusters, and other gizmos at their disposal, they can make like Han Solo and Chewbacca. When the ride begins, the ship responds, in real time, to the actions of the crew. No two rides are ever the same. Does the Falcon need to abruptly bank left to avoid crashing into another ship? The pilots had better bank left. Are enemies attacking the ship? The gunners need to return fire. Is the Falcon losing power because its shields have been breached? It’s up to the engineers to restore the systems. Getting to the controls is half the fun. Winding through the ship’s docking bay, the crew receives its mission orders from Hondo Ohnaka, a space pirate engaged in questionable import/export practices. Hondo is a next-gen animatronic figure that is eerily lifelike. Walking along a jet bridge, guests enter the main hold of the Falcon and get to hang for a few moments there to ogle its contents, including the holochess table. When they are summoned for their mission, crewmembers walk the Falcon’s familiar hallways en route to the cockpit. Star Wars: Rise of the Resistance— The second attraction at Galaxy’s Edge is epic, in length, ambition, and sheer wow factor. Using multiple ride systems, guests experience Rise in a series of acts. A ride aboard a spaceship is intercepted by the First Order, which uses a tractor beam to transport the ship to a Star Destroyer. The size and scale of the show building is massive. Stormtroopers whisk the captured guests off to holding cells. But the Resistance hatches a plan to rescue the prisoners, and the guests end up ensnared in a battle between the forces of good and evil. For part of the attraction, visitors board trackless ride vehicles and make their way under enormous—and enormously ornery—AT-AT walkers. The timeframe of Galaxy’s Edge is the current Star Wars movie trilogy. During the Rise attraction, guests encounter characters from the series, including Kylo Ren, Finn, Rey, BB8, and Poe Dameron (along with his red X-wing ship). Disney has done an impressive job taking Earth-based items, combining them in unique and interesting ways, and introducing surprising tastes and textures to develop dishes and beverages that would seem to come from another galaxy. Some of them, such as Blue Milk, have been directly referenced in Star Wars movies or mythology. (The frozen concoction, available at the Milk Stand, comes in green as well as blue hues. Despite the name, the drink is actually made from non-dairy products.) Others are Galaxy’s Edge originals, many of which have their own intriguing backstories. The primary dining location is the quick-service restaurant, Docking Bay 7 Food and Cargo. The slapdash eatery includes cargo crates and pods that have been repurposed into seating areas. Among the available items is Endorian TIp-Yip. It’s actually fired chicken (shh! Don’t tell anybody), but the meat is cut into oblong pieces so that it no longer resembles poultry (and presumably looks like tip-yip). Likewise, butchers have cut racks of pork ribs lengthwise so that the Smoked Kaadu Ribs served at Docking Bay 7 look otherworldly. The sticky ribs, which are sweet and spicy, are served on blueberry cornbread. Perhaps the most unusual place to nosh at Galaxy’s Edge is Ronto Roasters. It’s a BBQ joint unlike any found in Memphis, Austin, or any other city known for its smokehouses. The scene at the food stand, which is located at the front of the outpost’s marketplace, is wild. A droid turns meat on a spit fueled by a podracing engine that has been modified as barbecue smoker. The ronto is a pack animal from the desert planet, Tatooine. You can purchase a Ronto Wrap, which features a delicious combination of smoked “ronto” (it’s really pork, but let’s keep that between us), a small sausage, and cabbage slaw that’s topped with a fiery “clutch sauce” (think Darth Vader’s Force grip) and tucked into pita bread. The Modal Nodes, the band seen performing at the Mos Eisley Cantina in the original Star Wars film, do not have any gigs at Galaxy’s Edge. But you can hear DJ Rex, the droid last seen piloting the Starspeeder 3000 in the original Star Tours, spinning intergalactic tunes at Black Spire Outpost’s own watering hole, Oga’s Cantina. You can belly up to the bar and order interplanetary drinks, including cocktails (which represent the first time alcohol is being served at Disneyland Park) such as a Dagobah Slug Slinger and a smoke-spewing Bespin Fizz, brews like Bad Motivator IPA, a craft beer that is exclusive to Galaxy’s Edge, and non-alcoholic choices such as Jabba Juice and Carbon Freeze. Many of the items for sale at Black Spire Outpost come with minimal or no packaging and look hand-crafted. In fact, you could handmake some of the items yourself. If you want to try and wield the Force, you could head to Savi’s Workshop–Handbuilt Lightsabers and custom design your own lightsaber. You choose the hilt (which is made of metal and feels substantial) and the kyber crystal that will activate the device and give the blade its characteristic color. The shop, which limits the number of guests who can build lightsabers to small groups, is as much an attraction as an opportunity to purchase a souvenir. Similarly, you could fashion your own R-series or BB-series droid at the Droid Depot. Assistants are on hand to help you choose the processing chips and other parts as well as assemble the units. These are not passive toys. The functional droids come with their own controllers and can interact with other droids and elements throughout Batuu. Be sure to visit Dok-Ondar’s Den of Antiquities where the eponymous owner, an Ithorian, is on hand to oversee the shop. You could try to haggle with him over holocrons and other rare items, but you should know that he drives a hard bargain. The imposing Dok-Ondar, another stunning example of Disney’s animatronic prowess, literally talks out of the side of his mouth. Other shops, which are housed in the marketplace’s stalls, include Toydarian Toymaker, Black Spire Outfitters, and First Order Cargo (where you can stock up on goods from the nefarious empire, if that’s your thing). Expect high demand for Galaxy's Edge and its two attractions, especially during the year after the lands open. At the time this was published, Disney had not revealed exactly how the parks would handle entry into the lands, but it did indicate that it would limit the number of visitors and require (free) reservations in order to get into Galaxy’s Edge. Check with the official Disneyland and Disney World sites for the latest information and be sure to make reservations for your visit. Admission to the Star Wars lands is included with admission to the parks, but entry is not guaranteed, especially after the lands first open. Note that Disney is not planning to open Star Wars: Rise of the Resistance until later in 2019. If you want to experience both of the major attractions, you shouldn’t plan your visit during the first months that the lands are open. In order to accommodate the massive crowds expected to descend on the two lands, Disney has indicated that it will not offer FastPass+ reservations at Disney World or Fastpass/MaxPass reservations at Disneyland for the two attractions at Galaxy's Edge. Expect long lines and wait times. When (and if) Disney does allow attraction reservations, be sure to take advantage of Disneyland’s Fastpass and its MaxPass programs as well as Disney World’s My Disney Experience and Fastpass+ programs. Consider using the single-rider lines at the attractions. It's likely you wouldn't be able to ride with your friends or family members, but you you'd probably knock a fair amount of time off of your waits in the queues. To help keep you occupied during the inevitably long waits, consider downloading the Play Disney Parks app to your mobile phone. It's loaded with interactive games and experiences that will get you and your park buddies engaged with the attractions and the lands. More than just helping to pass the time while waiting in line, the Play Disney Parks app has special features developed for Galaxy’s Edge that would allow you to explore the lands on a deep level. For example, the app includes a hacking tool to download intel from the data banks of droids on Batuu. You could also decode symbols engraved into stone walls, locate and tune into transmissions broadcast in the lands, and scan cargo and other items to determine what’s stored inside. Make the leap to lightspeed. If you get one of the coveted pilot’s seats for Millennium Falcon: Smuggler’s Run, be sure to use the thrusters to engage hyperdrive. Then hang on tightly! Take advantage of the Mobile Food and Beverage Ordering services offered at both Disneyland and at Disney World to preorder and pay for your meals at Docking Bay 7 Food and Cargo.